If you’ve never plugged in, now is most definitely the time. Here’s to many, many more GSGs! Build, sounds and playability, plus extensive options. In this ‘60’ shape with thick body, it’s a Les Paul Junior with the ‘wrong’ name on the headstock. Few of our long-time readers will be unaware of Gordon-Smith Guitars: founded in the mid-70s, it is the UK’s longest-running production guitar company. Made primarily by the husband/wife team of John and Linda Smith - with the considerable help of Chris Smith (no relation) - it never advertised its instruments, never had a bank loan and just kept at it. After 40 years and around 13,000 instruments later, John and Linda retired and GSG was sold, in 2015, to the Auden Musical Instrument Company, which now makes the guitars in its workshop in Higham Ferrers, Northamptonshire. So what’s changed? Well, not an awful lot, if we’re honest. We’ve lost the hyphen in the name (which immediately differentiates the new from the previous) and there’s a visible wheel-style truss rod adjuster, but outwardly our GS-1 embodies GSG’s straightforward, no-nonsense approach. 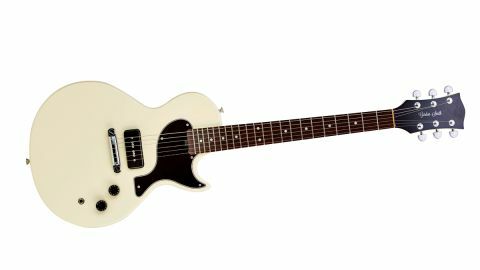 Now, the GS was always the start-point to the range: a thin-bodied (36mm), symmetrical double-cut Melody Maker-style guitar. The single-cut ‘60’ option was added in the 90s and, you could - and still can - spec your own flavour. So while the £600 base model GS-1 features a simple specification - all cedar construction with satin natural finish and single GSG humbucker - our sample adds £295 in terms of upgrades: locking Gotoh tuners, all-mahogany construction, a deeper 44mm-thick body, a proprietary P-90-style soapbar single coil, and a gloss-topped solid colour finish. There are others, too, not least twin humbuckers or P-90s, a GS-2, or a humbucker/P-90 at bridge with a neck-placed single coil - the wittily entitled GS-1.5. Left-handers are the same price and have the same options. a thick or thin option (ours is the thick and measures 21.6mm at the 1st fret, 24.2mm at the 12th) and retain quite a wide width: 43.6mm at the nut, 52.1mm at the 12th. Fingerboards always had a conical radius - the new ones revert to a single 305mm camber. But whatever the slight differences, this sample is very smartly built and attired in a very clean Vintage White. GSG seems to be in very safe hands. Comparing the GS-1 with our ’57 Les Paul Junior, the contemporary guitar certainly falls into the right ballpark with a similar weight, slightly slimmer, less-rounded neck profile and slightly airier top-fret access thanks to the lack of the Juniors’ lip in the cutaway. GSG always used what it believed was the actual scale used by Gibson in the 50s - slightly shorter than the quoted 24.75 inches - and while it’s a personal preference, these guitars can easily take 0.011s. Here, with a slinkier setup and lighter strings, it’s a little ‘plinky’yet sounds a little ‘overwound’, with a slightly rounder high-string response. There’s also pickup hum, always a problem with the P-90’s single-coil design and something you have to live with. With a gained, crunchy Marshall voice, the GSG gets close to the mahogany ‘grunt’ of the original... the more complex, grainy character of the P-90 is evident. Control choice is also crucial to maximise the ‘one’ sound. Our original Junior always surprises, the tone control pulling back some of the aggression for an almost jazzy voice that can sound surprisingly acoustic at lower volume. The GS-1 is more so-so; there’s less tonal range. With a gained, crunchy Marshall voice, however, the GSG gets close to the mahogany ‘grunt’ of the original. There’s a little less power here (despite a 9.8kohms DC reading from the pickup), but that subtly cocked wah character is evident, as is the more complex, grainy character of the P-90. With a few minor tweaks (we added firm rubber under the pickup and moved it closer to the strings), the GS-1 gets close and like any good Junior-style guitar has to be one of the definitive classic rock rhythm machines, a punk/garage staple and a visceral slash-and- burn lead axe, as well as a default slide guitar. It certainly seems the new owners of Gordon Smith have the production know-how and distribution to take this almost ‘underground’ brand bang into the mainstream. GSG is also proving that an old-school production guitar can be made in the UK and still be affordable, with prices that in many cases are better than Far Eastern imports, while offering a raft of custom options. For us players, it’s win-win.